Awesome earphones and makes a change from the black version! 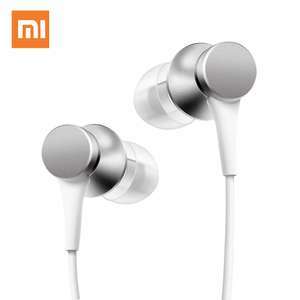 Original Xiaomi Piston In-ear Earphones Fresh Version adopts the third generation damping balance system, optimizes the three-frequency performance, and provides the clear and pure sound for you. Make sure you're logged in or the code won't apply! fake what? what an arrogant comment. This has been similar price (or even cheaper) with discount codes. I have few pairs of them. Still waiting on the first pair I ordered three weeks ago! fake what? what an arrogant comment.This has been similar price (or even …fake what? what an arrogant comment.This has been similar price (or even cheaper) with discount codes. I have few pairs of them. Gearbest are like a lottery, you can get real or fake. They don't publish 1 star reviews of fake items. The last Xiaomi earphone deal on HUKD was full of people saying they bought Xiaomi earphones previously and the sound was poor, they broke after 2 weeks etc. Guess why? £4.35 incl 2 week delivery and insurance. Had bad experience with GB last year ans didn't pay the insurance for some Xmas gifts. Lesson learned hopefully. Worth a punt for the price of a pint. £4.35 incl 2 week delivery and insurance. Had bad experience with GB last …£4.35 incl 2 week delivery and insurance. Had bad experience with GB last year ans didn't pay the insurance for some Xmas gifts. Lesson learned hopefully.Worth a punt for the price of a pint. 2.25 a pint......tell me where? Even just as a set of spares in my Gym bag these are worth a try. Ordered black version of these a while back. Best set of in-ear earphones i've had before. Ordered another pair as a spare. £2.25?..... why not! Gearbest are like a lottery, you can get real or fake. They don't publish …Gearbest are like a lottery, you can get real or fake. They don't publish 1 star reviews of fake items.Xiaomi are MASSIVELY counterfeited in Asia. Fake earphones outnumber genuine ones by literally 10:1 The last Xiaomi earphone deal on HUKD was full of people saying they bought Xiaomi earphones previously and the sound was poor, they broke after 2 weeks etc. Guess why? you can say some of the xiaomi products may be poor in quality but just because the sound was poor or the item was filmsy don't neccessarily mean the products are fake. The genuine products can be just poor as well. That's the point I want to make. I'm a native chinese myself, can read and write chinese, and of course, can tell whether the earphones are genuine or fake by looking at the boxart, instruction manuals and the actual quality of the product. I got these a while back grom GB for about £1.80 - Fantastic headphones. Ordered, got the black ones the last time they were on offer. you can say some of the xiaomi products may be poor in quality but just …you can say some of the xiaomi products may be poor in quality but just because the sound was poor or the item was filmsy don't neccessarily mean the products are fake. The genuine products can be just poor as well. That's the point I want to make.I'm a native chinese myself, can read and write chinese, and of course, can tell whether the earphones are genuine or fake by looking at the boxart, instruction manuals and the actual quality of the product. "thanks for this, just found out my xiaomi headphones are fake "
"I probably got fakes. They didn't have a QR code and if I move the cable while I'm using them, the sound cuts out"
"I also got counterfeit headphones… I'm a bit annoyed. I'll message the rep and see what I get back from them." "Yep just checked mine against the link above and i got 2 fakes in the last 6 weeks…..so annoyed!" "the recent aud$17 / usd$13 deal.. are fakes ... the aud$23 / usd$17, back in August are still genuine"
What am I doing wrong. I put the code "OXPistonUK" in and the price increases to £5.43??? What am I doing wrong. I put the code "OXPistonUK" in and the price …What am I doing wrong. I put the code "OXPistonUK" in and the price increases to £5.43??? Has to be the silver ones? Thats what I'm ordering. Even says fixed price code when I enter it. You need to order just one pair at a time to get this price. HUKD was full of people saying they bought Xiaomi earphones previously and …HUKD was full of people saying they bought Xiaomi earphones previously and the sound was poor, they broke after 2 weeks etc. Guess why? Maybe they listen to bad music and are heavy handed ?. I never said Xiaomi products are poor in quality. Generally they are very …I never said Xiaomi products are poor in quality. Generally they are very good. I said the ones in this deal are probably fakes. For 3 reasons:1) Below Chinese RRP2) Highly counterfeited product3) Sold by Gearbest (known to sell fake Xiaomi, higher chance of getting a fake when heavily discounted)https://www.ozbargain.com.au/node/335080#comment"thanks for this, just found out my xiaomi headphones are fake ""I probably got fakes. They didn't have a QR code and if I move the cable while I'm using them, the sound cuts out""I also got counterfeit headphones… I'm a bit annoyed. I'll message the rep and see what I get back from them. ""Yep just checked mine against the link above and i got 2 fakes in the last 6 weeks…..so annoyed! ""the recent aud$17 / usd$13 deal.. are fakes ... the aud$23 / usd$17, back in August are still genuine"
Not very convincing judging by couple of reviews on a different website. You will notice the price of this earphones has been this low for quite a while. I wonder why this post is still active when it clearly is not working and has been reported expired 8 hours back! If you are willing to spend a bit more I found these quite good (but I got £6). The wires dont get tangled easily either. Heat added - ordered 2 pairs, code worked ok for me.